The ladies represented their schools proudly on Tuesday, Sept. 18th at Westminster Trails Golf Club in both the TVRA Central and Tri-county leagues. Congratulations goes to Cindy Won of Lucas who shot a round of 87 to win the A flight for TVRA Central. Congratulations goes to Madison Telford of Parkside C.I. who shot a round of 89 to win the A flight for TVRA Tri-county. 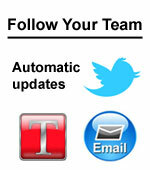 All scores are listed under the Fall Golf tab on the main page. Thank you to Wade Walker who convened the event, Westminster Trails GC and all of the coaches!